Standing close to the entrance of the Abbey is the Font. This is the place of Baptism, the rite through which Christian people are made members of God’s family, the Church. 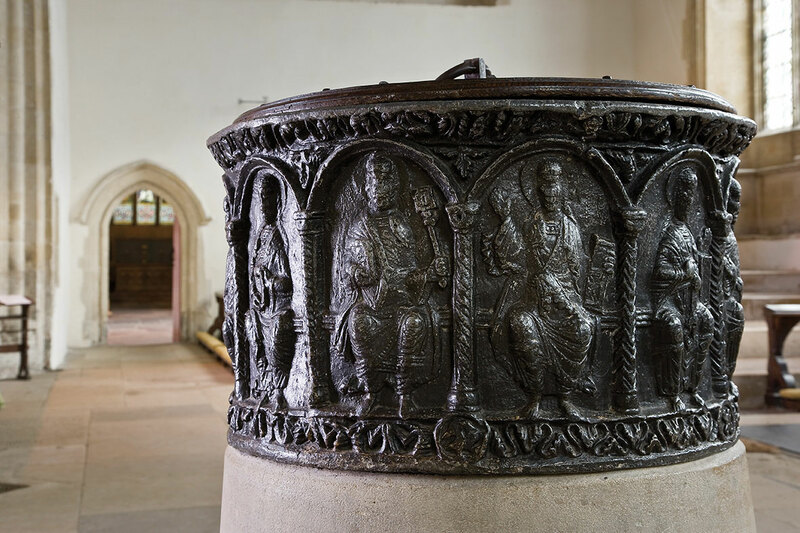 One of only 30 remaining lead fonts in Britain, the font welcomes all visitors to the Abbey at the beginning of their visit. Dating from c.1170-80, and the only remaining fitting from the 12th century monastic church, the high-relief casting shows eleven haloed figures, possibly apostles, seated beneath arcading, all holding a book. Some of the figures can be identified – St Peter, the original patron saint of the Dorchester church, is holding a key in his left hand. The font may have been made locally, for the figure with his hand held in blessing is similar to the Christ in Majesty figure on the Wallingford Castle seal from c1170. The present flat, wooden cover is Victorian. Earlier covers would have been much more elaborate and secure, to prevent a superstitious population taking away the holy water for dubious purposes. The hole in the base of the bowl ensured that all of the blessed water could drain away to the foundations. The plain, Victorian limestone base, designed by William Butterfield in the 1850s replaced a more ornately carved, octagonal 14th century stone base.